The Indiana University Bloomington (IUB) campus is often called “The Woodland Campus.” The name originally dates to the late Paul Weatherwax, an IU alumnus, faculty member, and botanist, who authored the original “Woodland Campus” publication highlighting the natural beauty of the trees and forests of the IUB campus. However, the dedication to natural beauty at IUB dates all the way back to the selection of the current location of the university by the Board of Trustees in 1884. Since it’s inception, trees have been an important and appreciated part of the Indiana University campus experience. Former President and Chancellor Herman B. Wells is probably most responsible for making the IUB campus woodlands a focal part of the campus that endures. In 2009 Sarah Mincey and Burney Fischer developed the IUB brochure “The Woodland Campus” to replace several long out of print versions of the brochure idea. This SPEA publication was a huge success and has been reprinted as well as provide on-line ever since. The Woodland Campus Tour (pages 13-20) was used by many students and visitors to appreciate the campus trees and learn how to identify common tree species. Over time the Tour has become outdated so the publication was recently updated and published by the Indiana University Integrated Program in the Environment (second edition, 2018), supported by a grant from the Indiana University Office of the Bicentennial. It was authored by Senna Bryce Robeson and Sarah Mincey with contributions from Zoe Need. Robeson S.B., Mincey S.K. and Need Z. 2018. The Woodland Campus. Indiana University-Bloomington, a Historic Walking Tour. Indiana University Integrated Program in the Environment. (2nd edition), 21 pp. Mincey, S.K. and B.C. Fischer. 2009. The Woodland Campus: A Historic Walking Tour of Indiana University-Bloomington. IUB School of Public and Environmental Affairs publication (1st edition), 20 pp. 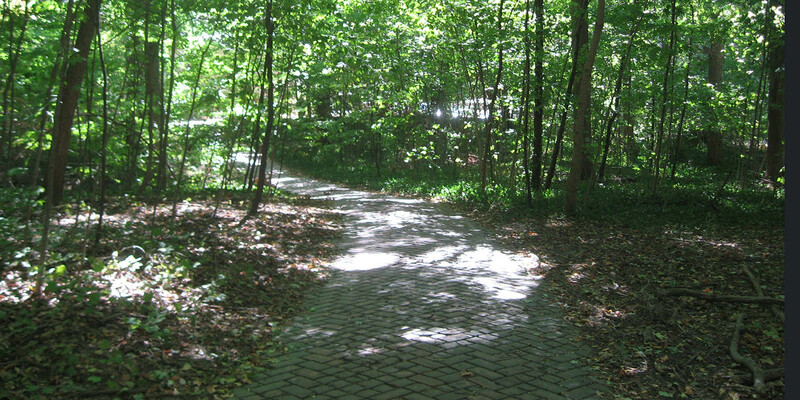 A path through Dunn Woods on the IU campus From wikicommons.